It's that time of year where some of us are a little nervous about our team's chances to make the postseason. However, we have to keep in mind that some have waited longer than others. Example: There are Cincy fans of legal drinking age who were not alive for the last Bengals postseason win. 1. Buffalo currently endures the longest drought with their last postseason appearance coming in the 1999 Wild Card Playoffs, the game most famous for the "Music City Miracle." You can actually watch the entire game here, for free, for now. It's interesting how adamant the announcers were about the lateral being a forward pass. 2. Oakland's last postseason appearance was Super Bowl XXXVII. Outside of last year's two Super Bowl teams, only the Giants and the Raiders last postseason appearance was in a Super Bowl. Here's the 1st half, and here's the 2nd half. There were riots in Oakland after the Raiders loss. Twelve cars were set on fire and 400 police officers were sent to control the crowds. 3. The Browns last played postseason ball in the 2002 AFC Wild Card Playoffs, a game where the Steelers rallied from a 17-point deficit, tossing three touchdowns in the final 19 minutes to win it. Here's the go-ahead touchdown with less than a minute remaining. 1. Cincinnati's last postseason victory came in the 1990 AFC Wild Card Playoffs, a team led by Boomer Esiason. 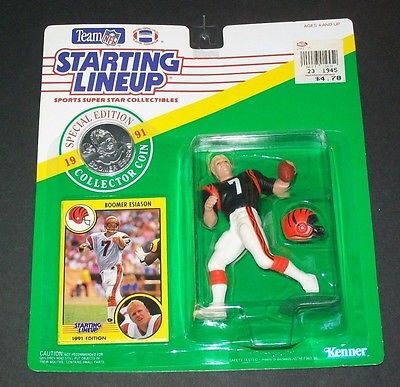 (Why does it feel as though everyone had his Starting Lineup figure?) Here are highlights from the 41-13 throttling at Riverfront Stadium. 3. Kansas City hasn't tasted postseason success since the 1993 AFC Divisional Playoffs, a roster that included Joe Montana and Marcus Allen. Here's the 1st Half of that game, which opens with a nice shot of the Astrodome, and we're feeling all the nostalgia. Here's the 2nd Half.